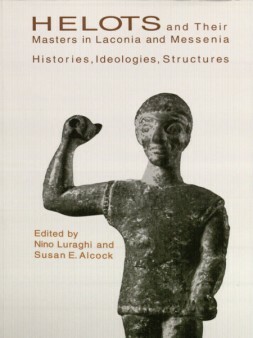 Nino Luraghi and Susan E. Alcock (eds. ), Helots and The Masters in Laconia and Messenia: Histories, Ideologies, Structures,online publication (available on the Center for Hellenic Studies website). The Center for Hellenic Studies announces the online publication of Helots and The Masters in Laconia and Messenia: Histories, Ideologies, Structures. The name “Helots” evokes one of the most famous peculiarities of ancient Sparta, the system of dependent labor that guaranteed the livelihood of the free citizens. The Helots fulfilled all the functions that slaves carried out elsewhere in the Greek world, allowing their masters the leisure to be full-time warriors. Yet, despite their crucial role, Helots remain essentially invisible in our ancient sources and peripheral and enigmatic in modern scholarship. This book is devoted to a much-needed reassessment of Helotry and of its place in the history and sociology of unfree labor. The essays deal with the origins and historical development of Helotry, with its sociological, economic, and demographic aspects, with its ideological construction and negotiation. “It is unlikely that the helots will ever shed that quality of Rorschach test, and indeed it might be a shame, given their evocative history, that they ever should. Still, this volume directs us towards new ways of analyzing and of envisioning these people. In part, this involves the nature of our questions: accepting our lack of detail about helots and helot life should discourage grand and totalizing narratives. Instead, the way forward seems to be through encouragement of alternative methodologies, such as the use of comparative data sets or of archaeology, to unpick more nuanced questions, in more localized fashions. Perhaps most fundamental of all is the need to reconsider our own starting assumptions, to grant the helots both capacities and hopes that the usual suspects of our sources have steadfastly denied to them. Nino Luraghi is Professor of the Classics at Harvard University. Susan E. Alcock is John H. D’Arms Collegiate Professor of Classical Archaeology and Classics at the University of Michigan.